I'm working on a project that involves the microcontroller being asleep most of the time, so i was looking into the different low power modes to ensure that low enough power could be achieved while maintaining a fast enough wakeup time. In the SAM3u Datasheet it says that wakeup time from the WAIT Mode should be around 10us. However, when i try out this very simple code I get a much higher wakeup time : almost 3ms between the time the button is pressed (waking up the SAM through WKUP6 pin) and the LED being set high. So what am I missing here ? 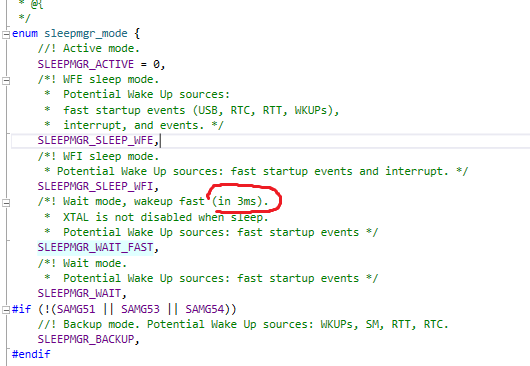 Clearly 3 ms is way too long to be called a fast wakeup, is there any way to reach the 10us mentioned in the datasheet ? But SAM3 is not an AVR. You're right ! I didn't post in the right forum. Thanks to the mods for moving it.